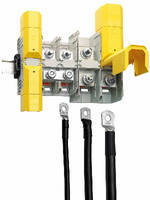 Ring-Lug Terminals suit high-current applications. Capable of accommodating conductors up to 600 kcmil with ratings up to 510 A/1,000 V, selos WRT Series provides safe, vibration-proof screw connections for railway, heavy equipment, industrial, and utility applications. All terminals mount on standard TS-35 DIN rails and are provided with nuts and integrated spring washer. Each terminal is capable of accommodating 2 cable lugs per connection point, and features touch-proof cover with test opening for safe voltage measurement. “The new selos WRT Series terminals provide power systems design engineers with a safe, maintenance-free, vibration-proof connection point for high-current conductors,” said Martin Lalonde, applications engineer at Wieland Electric. All of the selos WRT Series terminals are designed to mount on standard TS-35 DIN rails, and are sold with nuts and integrated spring washers. Each terminal is capable of accommodating two cable lugs per connection point, and features a touch-proof cover with a test opening for safe voltage measurement. The WRT series also includes cross connection jumpers to provide simple and reliable high-current potential distribution solutions. For more information about Wieland Electric’s selos WRT Series high-current terminals, please visit: http://www.wielandinc.com/sites/usa/files/field_files/wrt.pdf to access product specifications and other technical information. For more information about Wieland Electric and its other industrial automation products, please visit www.wielandinc.com or call 1-800-WIELAND (1-800-943-5263).